It’s a sizzling summer’s day on the south-west outskirts of Paris. The traffic is unmistakeably Parisian, a clotted, cacophonous mayhem of diesel-dusted Renaults, Citroëns, Peugeots and Piaggios. We take the crowded Pont de Sèvres up and over the Seine and as a chauffeur-driven Citroën C6 draws alongside for a moment its cool, pin-striped passenger swivels round in his seat to have a closer look at us. It almost qualifies as gawping. The attention is not just because our ride is unusually pristine and polished. It has more to do with the gaudy graphics that spell out “ZE 100% electric” in foot-high-letters across the rear windscreen. 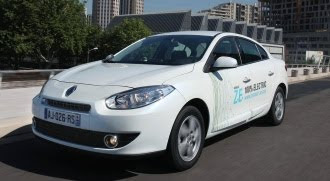 Today we are driving a Renault Fluence electric car, a battery powered five-seat saloon that Renault will bring to market in the middle of next year. Our Fluence looks and feels like a showroom-ready product, although it isn’t quite fully baked just yet. It is devoid of the more obvious development-car addenda – there are no red panic buttons jutting from the dash or fire extinguishers bolted to the floor, although we do notice a plastic label riveted to the top of the driver’s airbag. It says “electrically correct”, which we suspect means that the airbag isn’t live but is pretending to be, for hassle-free steering wheel removal. So that’s a good reason not to crash, aside from the fact that prototypes tend to be worth quite a lot of money. The most obvious difference between our test car and the Fluence ZE that will go on sale early next year is the size of its rear end. The lithium-ion battery – a bulky, quarter-tonne box the size of two big suitcases – lives immediately behind the rear bench, squatting directly over the rear wheels and occupying most of what might normally be called the boot. Hence a little rump surgery is due, which will elongate the production ZE body by 15cm compared with our standard Fluence bodyshell. Even after the stretch, boot-space will be tight compared to the fossil-fuelled Fluence. From the driver’s seat, however, it feels like those engineers can’t have much left to do. The Fluence ZE is already beautifully set up, with enough compliance to shrug off scabbed surfaces and little hint of a rear weight bias in sharp corners. We had expected more body roll, given that the Fluence carries its bulky battery high up compared with many other EVs. Instead of spreading the heavy cells out along the floorpan, as Nissan does with its Leaf EV, Renault has packed its cells into a big, oblong box, filling a void between the high parcel shelf and the floor. The design is no doubt a consequence of Renault’s decision to pursue battery swap-stations, which will need to be able to pull out the battery as a unit from beneath the car, without requiring too big a chassis-weakening aperture. As it is, the battery case, once bolted into place, is a stressed member, according to Stein. As well as offering admirable poise, the Fluence also serves up surprising acceleration. Floored at urban speeds, the 95bhp, 167lbft motor gives us a hefty shove in the back – sufficient to push ahead of ordinary traffic. The motor, drive-shafts, battery charger, inverter, coolant pumps and radiator all live under the bonnet, helping to balance weight distribution. There’s not much of a gearbox – just one forward ratio while for reverse, the motor is simply run backwards. Our car boasts air-conditioning, all-round electric windows and a very nice leather-rimmed wheel. Power assistance is electric, obviously, furnishing us with a light and rather tight-lipped helm. Visibility is good, marred only slightly at the rear by the rising waist and high rear deck. The controls feel remarkably unremarkable. The gear selector simply offers park, reverse, neutral and drive, the handbrake is manual, throttle response is linear and predictable, and regenerative braking is unobtrusive and feels a lot like petrol-engine braking. From a standstill in D, forward creep is perhaps unusually strong, but otherwise the only clue to the electric powertrain is the pin-drop silence of its delivery. All you hear around town is tyre-on-road noise, a very faint, high-pitched whine under acceleration and – if you drop the window – the droning engines of other cars. Start-up is a mundane affair – simply insert the key into its steering-column slot and twist. A little green car-shaped symbol on the dashboard informs you that all is well with the electrics. 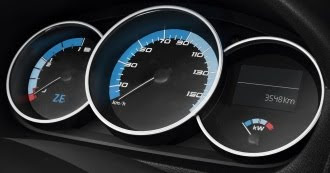 The instrument panel offers three dials – a sweep hand on the left gives battery charge from 1 to 0, the central clock is a large and clear speedometer, and finally to the right is a small dial marked “kW” that swings left or right depending on which of the two pedals you’re pressing and is, therefore, largely pointless. Above this swingometer sits the much more relevant trip computer, which can be set to show a variety of measures including the all-important range prediction. At the start of our run the prediction said 67km. Fifteen minutes and 5.1km of Parisian cut-and-thrust later it said 62km, so it is at least consistent. It is probably pessimistic too, given that we made much greater power demands than we normally might as we tested the car’s urge away from the lights. The Fluence is clearly a well-developed product from a major manufacturer and will be ready for the rigours of retail sale early next year – no argument. It’s probably not the right shape for Europe, though. Matthieu Tenenbaum, deputy director of Renault’s EV programme, is quite frank in his admission that the Fluence is better suited to the Israeli market where it will first go on sale (alongside Denmark) and where C-segment saloons dominate the market. The saloon shape may appeal to fleet buyers, but in the European private sector Renault needs a compact hatchback to slot into the electric car’s most likely niche – the second-vehicle runabout for families that also own a bigger conventional car. That’s not intended as a dismissive remark because it’s no small market – in the UK alone there are more than six million vehicles that share drive space with a larger sibling. 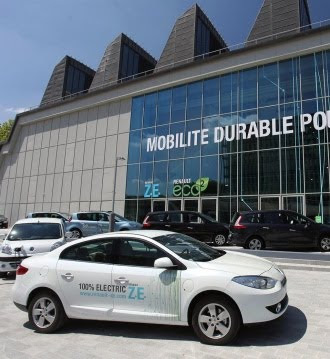 Unlike Fluence, Zoe may prove to be a make-or-break car for Renault’s electric car ambitions. Stein and Renault’s engineers face a stiff challenge, however. Somehow, they must squeeze the same standardised, wheelie-bin-sized battery into a smaller bodyshell, also carry at least four adults, and then find some room for shopping under the hatch. Quarts and pint pots come to mind. As revelatory as our drive in the Fluence ZE was, the Zoe will surely be even more of a surprise. We can’t wait.